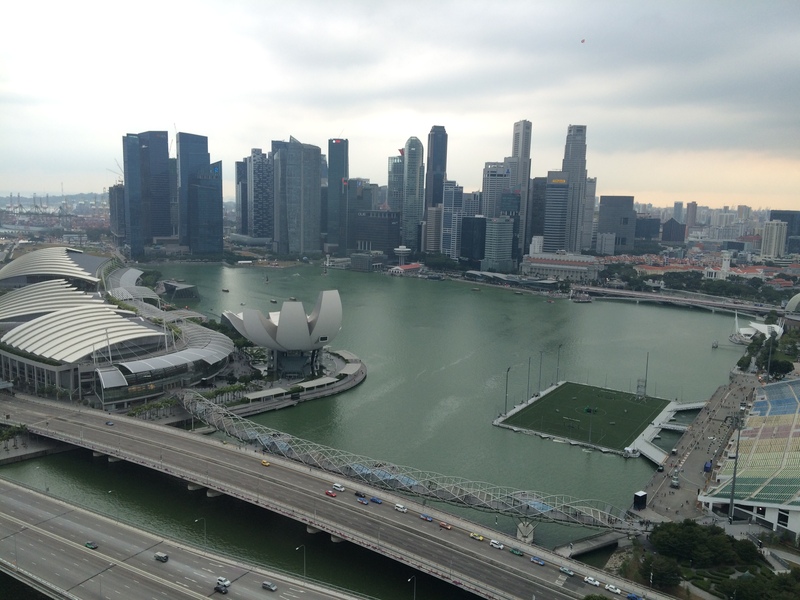 Singapore’s downtown skyline as viewed from the Singapore Flyer. My mother and I, exhausted from a day full of plane rides, order a shuttle bus to our hotel in Little India. It’s night; we step outside, we feel the 80-degree humid heat. Inside the airport, we are astounded by the diverse groups of Asians we encounter from all over the world. During the ride to the hotel, I look out the window. Cars drive on the left, the whole route is full of lush vegetation, and the city all around looks clean and beautiful — not much traffic seen anywhere. The very next day, we buy our Singapore tourist passes for the unlimited use of public transit; the most affordable way to get around the city. The humid weather of Singapore tires pedestrians. Many walk down to the local MRT (Mass Rapid Transit) station, board the train, and the AC provides relief. They get off the train, tap their card on the turnstile, and take a short walk to an underground mall entrance. The station and trains are clean, free of graffiti, grime, and trash, and crowds of people ride the MRT everyday. The markings on the floor tell passengers where to board and get off the train. The rails on the floor guide the blind to train doors, and the glass keeps people from falling off the platform. We came to explore the MRT, which is the Singapore’s rail network overseen by the Land Transit Authority (Singapore’s version of Metro, and see what Metro and Angelenos can learn.) Los Angeles’s train system, however, does not compare with the efficiency and cleanliness of the MRT. Trains come at almost every five minutes. Many of the Singaporean malls are directly connected to the train stations, and the trains pass by many of the condominiums and apartments of Singapore. The car seems inconvenient in the city filled with dense housing and reliable transit service. But before considering how Los Angeles could improve, differences between these two metropoli must be considered. First of all, Singapore is roughly half the size of Los Angeles with a higher population density. The small size of Singapore, large population, and narrow streets makes transit imperative. Los Angeles is simply too big to accommodate such a system over a short period of time. Metro, unlike Singapore — whose officials decided to build public transit with the city’s growth — has to build a system covering an area that was formed by the car. Moreover, Singapore and Los Angeles have different administration of the public transit system. LA’s Metro is government-run, whereas, in Singapore, the Land Transit Authority (LTA) oversees and regulates public transit operated by companies: SBS Transit Ltd. and the SMRT Trains Ltd. (Official information about the transit governance). There are other factors Los Angeles cannot replicate from Singapore, such as vandalizers facing three canings (beatings with a cane), which could leave the buttocks bloody. In addition, Singapore also imposes heavy taxes on purchasing and owning a car. After taxes, a new Honda Civic can come out to cost more than $100,000 USD. This helps keep traffic low and incentivized citizens to use public transit. Singapore’s Land Transit Authority held a bus expo at VivoCity mall, where many people attended. Comfort with diversity also helps Singaporeans feel safe. Shankari, a Singapore college student riding the North-East line, said, “[We] come in contact with different groups of people, not much interaction” when riding the MRT. With this level of comfort with each other, there is little fear in riding the MRT, unlike the Metro, where people fear riding with different groups of people. As we headed back to the airport, my mother and I reflected on what elements of the MRT Metro could learn from. Interestingly, adding more incentives to take the public transport matters a lot like rewarding riders with prizes or a free ride for continuously riding the train. In addition, integrating businesses with stations encourages people to take the trains. The MRT usually connects to an underground entrance of shopping centers and features restaurants in the upper levels of the subway station. The small details count, and shopping is a big one. It’s important to also note that The Bloc, a new shopping center replacing the Downtown Macy’s Plaza, will feature an underground entrance to the aforementioned center, so this is a step in the right direction. People crowd the exit of an MRT station. Most are heading to the VivoCity mall, whose entrance can be seen. Finally, it all comes down to Angelenos. Out of habit, they must start using Metro more often in order for a system to work. As noted by Lisa Schweitzer, USC professor who specializes in urban studies, simply taking weekly (if not daily) trips helps Metro boost ridership and thus revenue, helps businesses near the trains, and will lead to Metro expanding its ridership demographics. Singapore is an amazing country, and by the efforts of Angelenos and Metro, maybe Los Angeles can have a world-class public transportation community like Singapore. All photos were taken by Jesús Estrada, the author of this article.